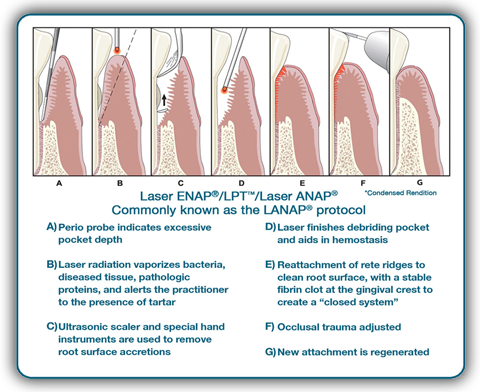 LANAP™ is a gentle, conservative, non-invasive method of treating gum disease without cutting, suturing or removing healthy tissue. Using a precision laser, Dr. Martin is able to kill up to 99% of the disease causing bacteria in the periodontal pockets. The laser specifically targets disease causing bacteria and because they have no defense, the bacteria can not adapt and avoid elimination as with anti-biotic treatment. Additionally, the precision of the laser allows Dr. Martin to avoid removing significant tissue. This allows for a faster recovery and minimal loss of tooth and bone structure after the procedure. F. Bite is adjusted and trauma is reduced. G. Healing with bone regeneration occurs.